Well Friends, here it is…the fall mantel I have been lovingly preparing to welcome yet another season. As usual, I tried to use inexpensive items that with a little work become little treasures. 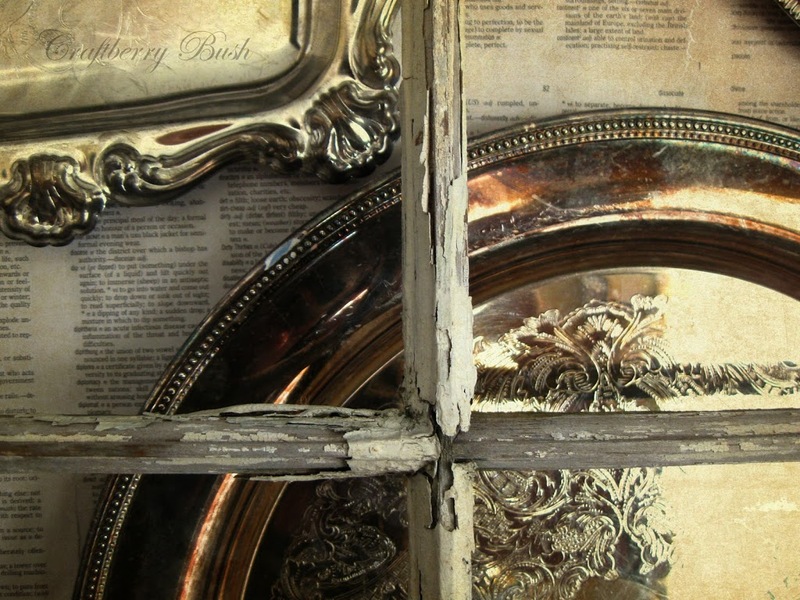 But only time can create such perfectly imperfect patina on that silver plate and the chippy wood on that old window frame. I used a dollar store dictionary and dyed the pages with tea, allowing them to dry before ironing them to restore their crispness. I then glued them onto a large sheet of very thin plywood that was laying in the garage. converted these pumpkins from the Dollar Store. 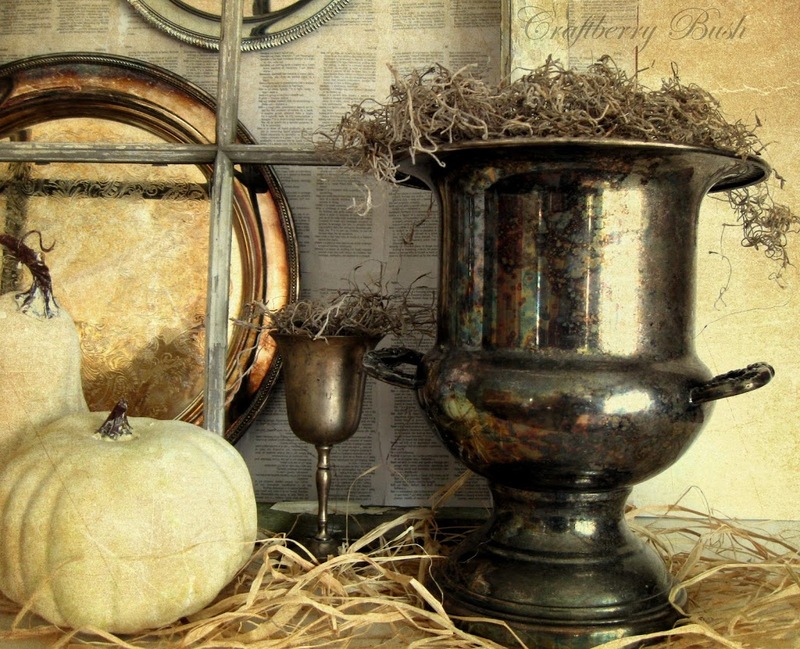 The silver cup at the back was given to hubby by his grandmother when he was born; the urn with the gorgeous patina was found at our local thrift store and it was originally a trophy of some sort. While in line at the store, a gentleman was giving me tips on how to clean the silver. I smiled and thanked him, but the patina was exactly what I am most in love with. Real sterling silver will always clean to its beautiful original shine, yet plated silver, if left for too long, will acquire that bluish tarnished patina and might need to be re-plated in order to be restored to its original appearance. The number 925 or a stamp of a lion are two easy ways to recognize if an item is real sterling silver. 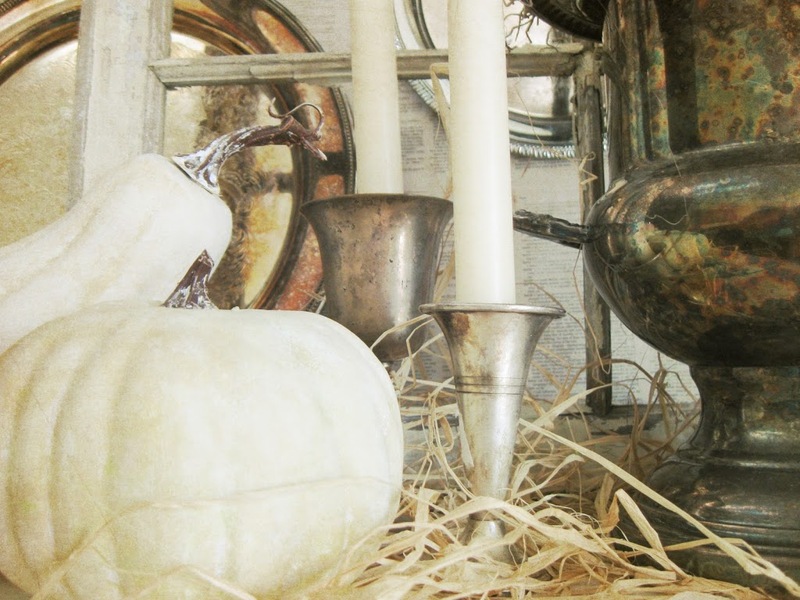 There are only three sterling silver items on this mantel…can you guess which three? 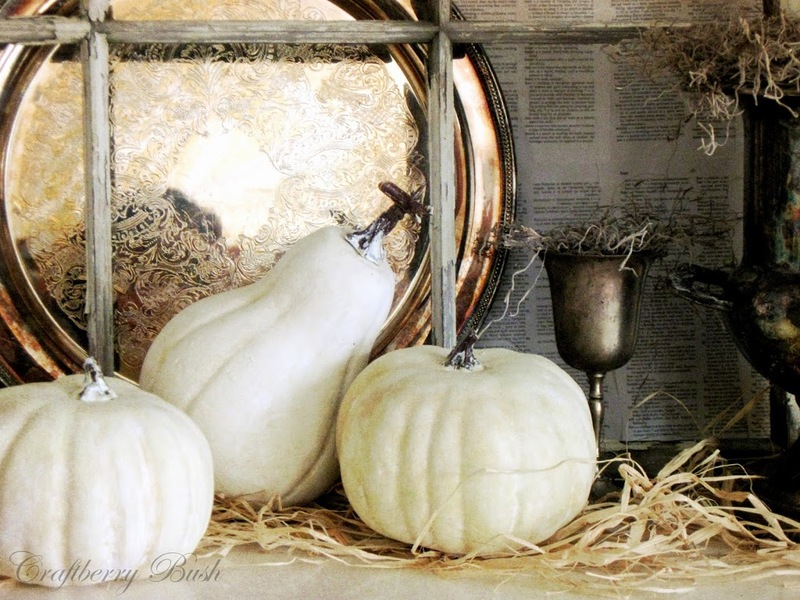 I will be replacing the branch in the urn with a large white pumpkin, creating more balance. Balance is always important when decorating. Notice how the darkness of the camera on the left is mirrored on the urn and ever so slightly with the bird on the right? So my dear friends, that is my fall mantel…at least for now. I am sure I will look at it a few days and change a thing or two (does that ever happen to you? ), but in the mean time, I hope you like it and can draw inspiration from it. Thank you once again for stopping by…can’t wait to see you again soon. Linking here, thank you for taking the time to host! Previous Post: « Musings while the paint dries…. so dang pretty! I love the silver and the book pages on the plywood. This looks fantastic — I love it! Very beautiful mantel! If I had a manetl in my home I would want it decorated exactly this way..I love it!! Visiting from My Romantic Home. I love your Mantel, you did such a Beautiful job! I am in the process of finishing up mine and hope to post Finished pictures next week, stop by and have a look! It looks beautiful. I’m like you. always tweaking. 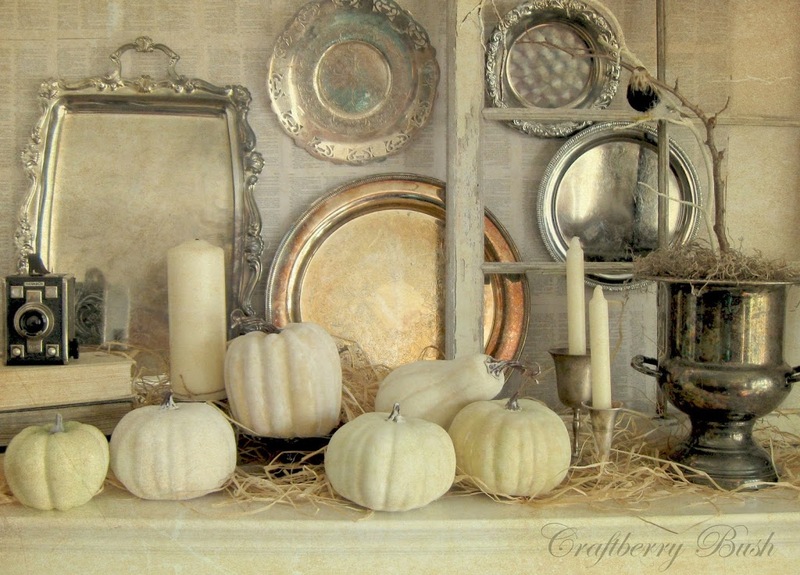 Your Fall mantel is beautiful The colors and textures are just wonderful. Oh I LOVE it!!!! This is so my way of decorating for this time of the year. Now I just need to get the darn stuff out of storage and up! hi Lucy! This is beautiful! Seriously beautiful! This looks just like the display I was drooling over in Pottery Barn – so awesome!! I featured you (again) today in my Friday I’m In Love favorites. that mantel is stunning! think i need to go to the dollar store. awesome work. I just saw your post on Show and Tell Friday; and your mantle is gorgeous! I love the mix of elements that you used! I am a newbie and your newest follower. I hope you will follow back! Be blessed! Wonderful job! My guess on the sterling is your husband’s urn, the trophy-type candle holder and the small plate on top and to the right? Right? Lovin’ it! All the silver looks great! Your mantel looks beautiful. Had I not read your previous post, I would have thought the pumpkins were real, or at least purchased that way. Your transformation is amazing. Your mantel is beautiful! 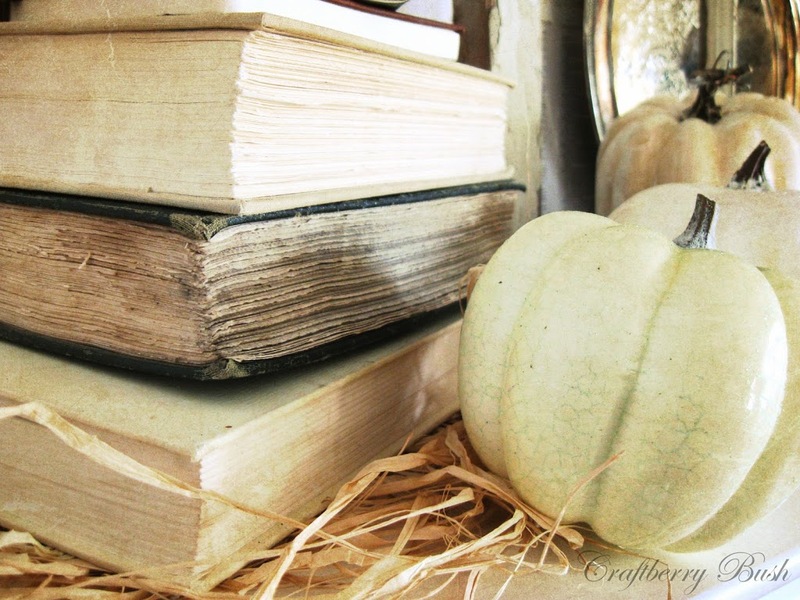 I love that you used the silver with the book pages and the white pumpkins! The tarnished silver is beautiful! Thanks so much for the inspiration! Have a happy weekend! Hi Lucy! This is my first visit and with just one look at your mantel, I am hooked! I’m going to follow along because I need to see more! this is perfection! holy moly! Love the window frame, Lucy! Beautiful! Great vignette, with fantastic ideas. Gorgeous!!! 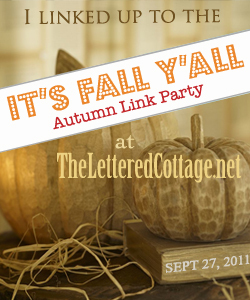 I would love it if you would stop by and share your mantel at my linky party! Just found you and joined as a follower, love your wonderful vintage mantle. Great bookpage background! Wow, Lucy! This is kind of blowing my mind, its so cool! Can’t get over all the beautiful layers here, starting with those book pages, what a great idea! Love all the depth you achieved with the contrasting texture and subtle color. Gorgeous. 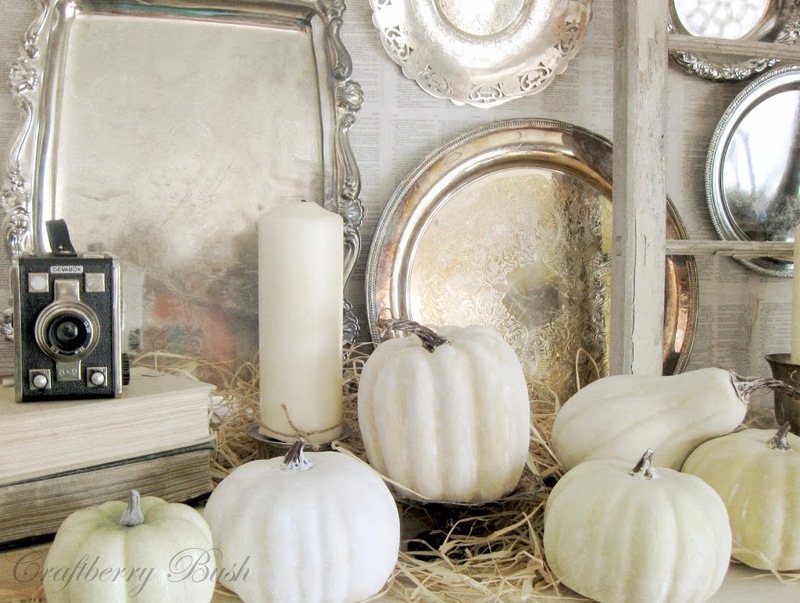 I’m a huge fan of vintage silver and I love how you’ve incorporated this into your fall mantel. I’m a new follower! I am off to read more posts and I am a new follower. So lovely! You have given me some great ideas! I don’t know where to begin…so I’ll just say…IT’S BEAUTIFUL! Always so original, dramatic, elegant, beautiful, and PERFECT!!! I LOVE it!!! Great! Love everything, perfect fit for my house! B e a u t i f u l! I love the colors, silver and white…And I love books anywhere, anytime! This is a winner. Very beautiful and unique! I just love it! Stunning! 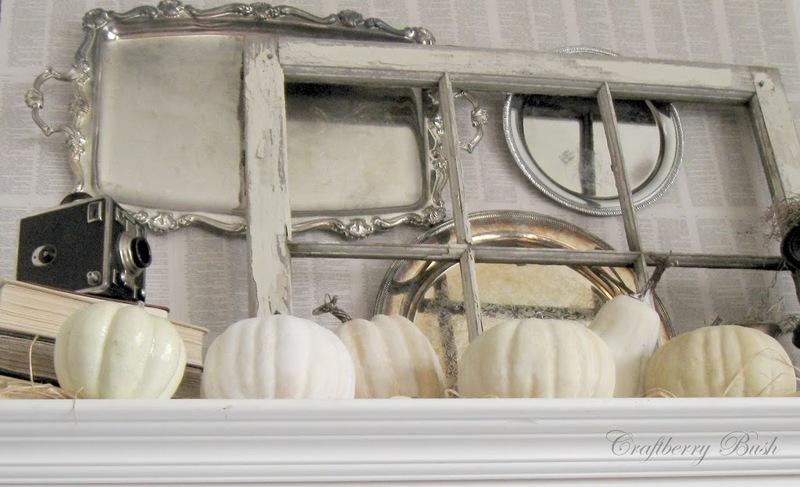 This may be my favorite Fall Mantel! Seeing this makes me want to further eliminate color from my decor and go with all white! Now Following! Hope you’ll follow back! Gorgeous! Your vignette is gorgeous. And you take the most beautiful pictures. Gorgeous! I love the light colours and the classy organic look! So, so pretty! ooo…. love love love this look. I have the same metal wine goblets (as in your pictures) that I got from a thrift store, and I used them as vases for my wedding centerpieces. I knew it was YOUR thumbnail the second I saw it! (on Layla’s fall party). Gorgeous girl, just gorg!!!! I love the silver behind the window. Great idea. Very pretty mantel. Visiting from Beth’s Tutes and Tips. I think your mantel is absolutely gorgeous! Everything is perfect! It is fabulously gorgeous – I love everything about it. Happy Fall y’all! What a beautiful display–love everything about it! The different shades of white and the old window, books and trays — stunning! Your mantel is Fabulous! I love the soft muted tones – you put a lot of thought and work into it and it shows! Your mantle is so very beautiful. I would love to try this but atop my mantle sits hubby’s large tv. So sad for me. Found this post via “blog hopping” and you have inspired me to make a fall mantle! Love your ideas!! I am your newest follower!!! 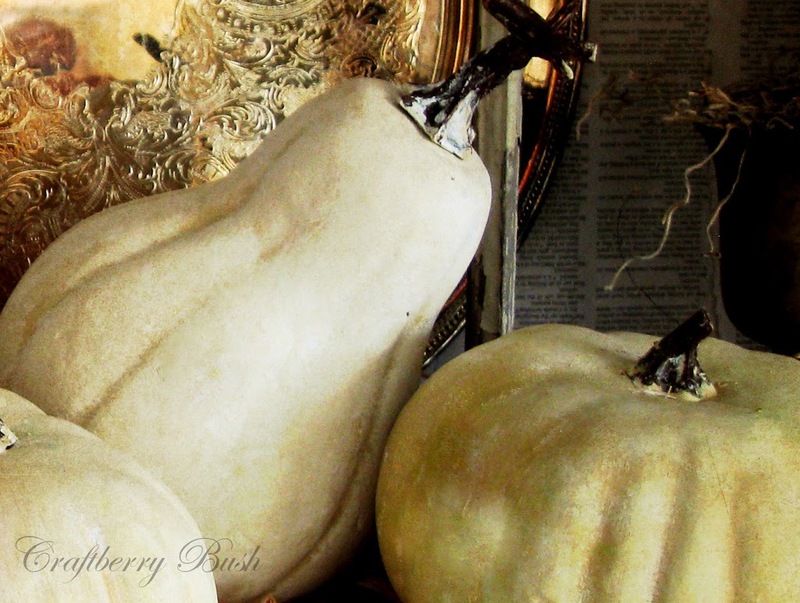 I love your take on a fall mantel. Very unique. I am a huge supporter of silver. I can’t pass it without buying it. Glad I stopped by. Loving your mantle! Simpy tres chic!! I’m now your newest follower and look forward to scrolling through all your inspiration! I’m all linked up and your newest follower. Your mantle is GORGEOUS! Lucy, Gorgeous, gorgeous mantle! I can’t believe how beautiful this is. This is absolutely stunning. I love the look of the book pages, the window and the serving platters all together. It’s a really great look. 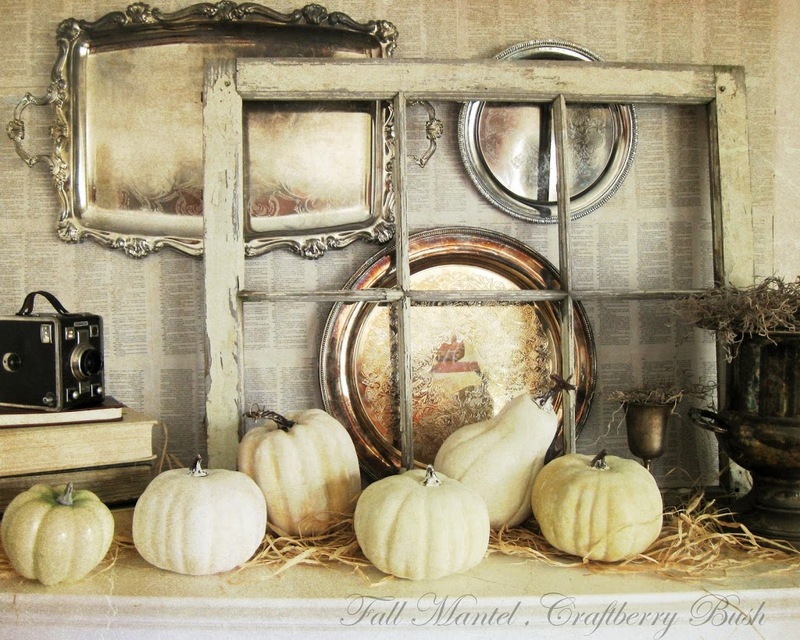 I featured it on my blog today under fall mantel inspiration. Thanks for sharing! This is magazine quality beautiful, Wow I love it. Beautifully artistic and creative, each element more beautiful than the last…just wow! Really love the look with the silver plates. Question: how do you hang the silver plates? I have some that I would like to display, but other than using plate hangers, I am wondering how to hang them. Thanks. Found this on Pinterest and love love love it. I know it’s about two years too late, but just wanted to leave a note. I’ll be including this in a web round up and linking back to your post!